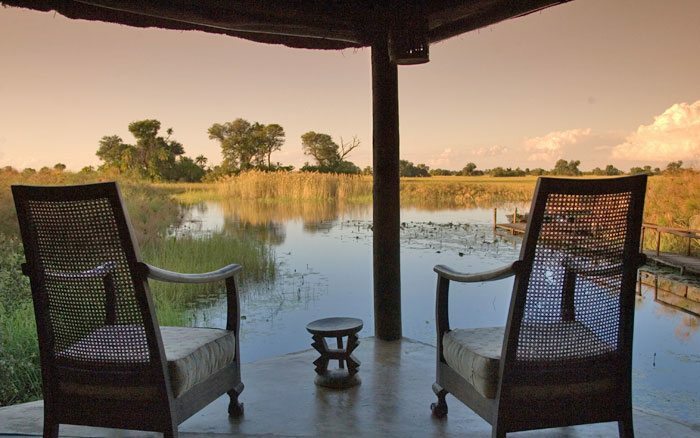 Nxamaseri Island Lodge is one of the original lodges in the Okavango Delta, having been established in the early 1980s. 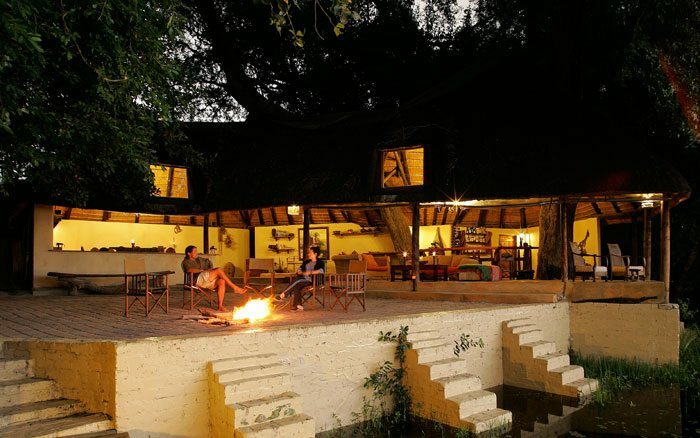 Nxamaseri Island Lodge is one of the original lodges in the Okavango Delta, having been established in the early 1980s. It has 7 chalets and 2 tree houses linked to the main area by wooden walkways through the greenery. 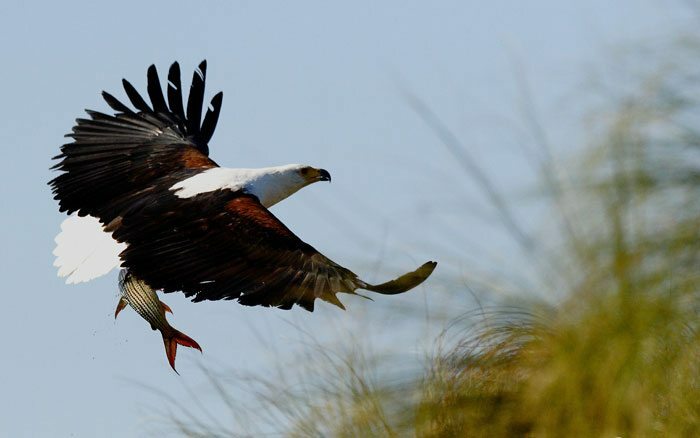 Wildlife viewing activities can be interspersed with cultural excursions, and fly fishing trips to produce a varied experience of the Delta. Rooms nestle among shady trees which offer seclusion as well as protection from the heat. Each is open to front where there is a private veranda facing the water for quiet downtime. There is a screen that can be lowered for privacy. Entering the chalet you’ll see a large bed draped in a mosquito net, plus shelves and tables that offer space for clothes and personal belongings. En-suite bathrooms have large showers and there’s a separate room with a flush toilet and hand basin. The tree houses are a short distance away set on a platform among the trees, reached by a walkway. They too are open to the front. 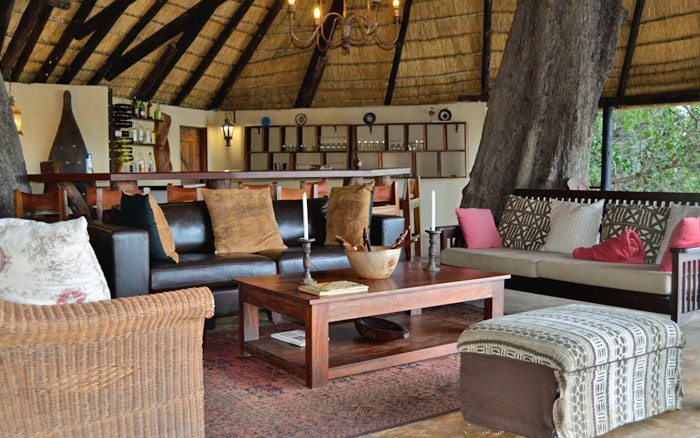 The lounge is filled with cushion-strewn sofas, ideal for kicking back after a busy morning exploring the Okavango. The open-fronted building leads out to a wide terrace. The bar has a good range of beverages and there’s free tea and coffee throughout the day. Dinner is eaten round the large communal table, accompanied by wine from the lodge’s cellar. 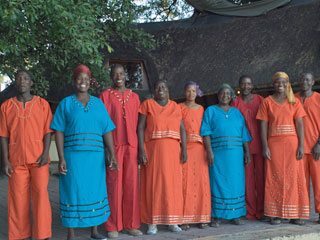 A highlight of staying here is a day trip to the magical Tsodilo Hills, a world heritage site and one of Botswana’s greatest treasures. 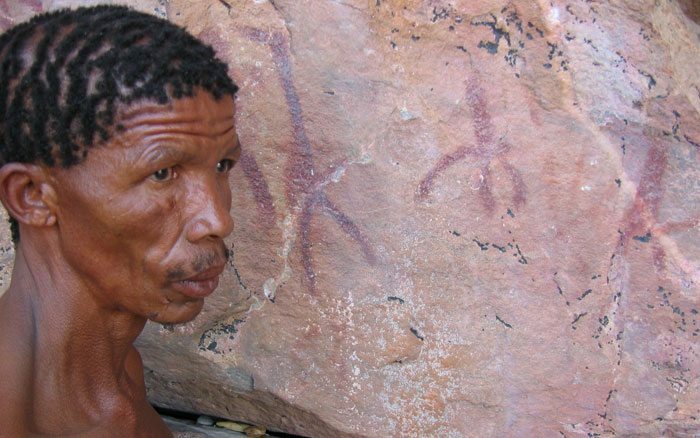 Here you’ll see some of the 2000 San paintings, ancient and modern, and learn about the Bushman way of life. Read more about the Tsodilo Hills. 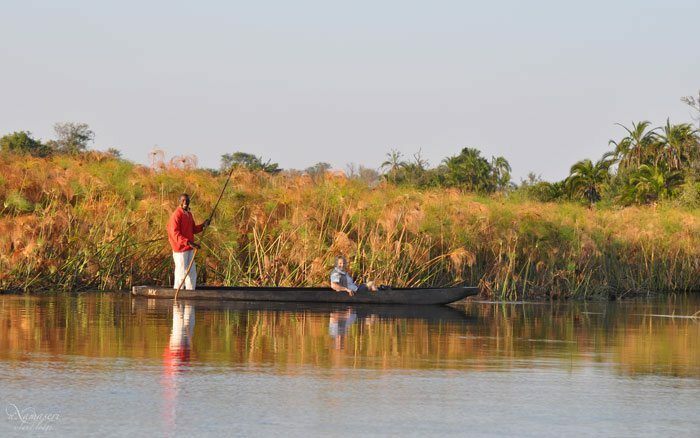 The lodge offers water-based activities, including boating and mokoro rides through the shallow water channels. You’re guided by an expert poler for close up glimpses of frogs, dragonflies, birds and colourful lilies. Specialist bird watching trips will show off the delta’s varied species. 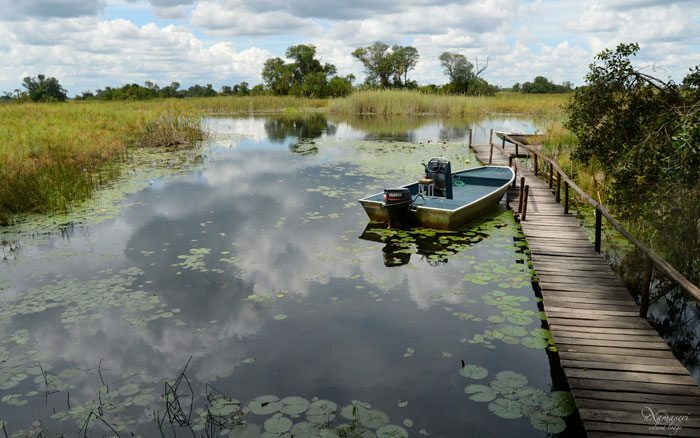 Nxamaseri is one of the best locations in the delta for fly fishing and lure fishing and its waters offer year round opportunities to catch tigerfish, bream and barbel. 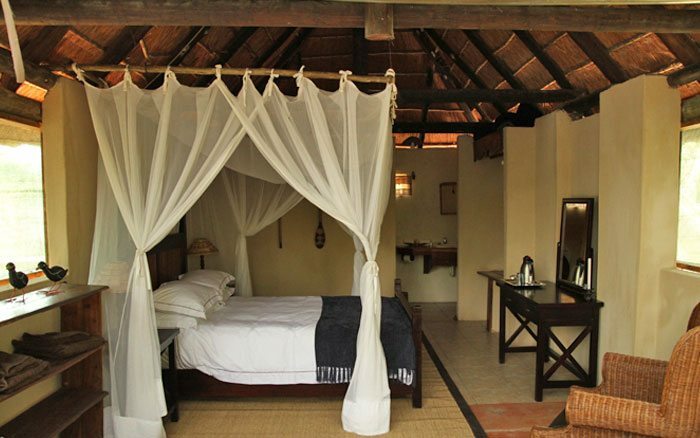 Chalets provide cosy, secluded accommodation, wooden furniture, local décor and private verandas by the water.